Brush your teeth for 2 minutes twice a day for dramatically whiter teeth WITHOUT MESSY TRAYS! The components work in tandem to safely and gently bleach & clean the teeth at the same time. Completely safe to the enamel. Three months supply. This toothpaste and accelerator start working right away and much better than any strips I have tried. Easy to use, just brush your teeth! You don't have to change your routine at all. This is an excellent product and it really is a good alternative to professional cleaning..I have been using for about 2 yrs now and am very pleased. I only use this toothpaste. I had a gap in my front teeth that was bonded, and what appealed to me about this product is that it whitens both regular tooth enamel and bonding resin. I can actually feel the grittiness/sand-like quality of regular toothpaste compared to using Supersmile, which is not good at all for the resin. Most importantly, it DOES whiten one's teeth amazingly well. It's even better if you leave the product on for like 10 minutes before brushing it off. The last time I had my teeth checked, they were actually whiter that the whitest shade on the shade chart. I have only been using this product for 3 days and already i see a noticeable difference. I can't believe how well it works especially since i feel absolutely no irritation. The only downside is that it does make my mouth feel dry but it's worth it for bright, white teeth. I read these - but never seem to write them....but I could not stay away from a review of this product - never before have I come upon something that works so well- so fast!!!! 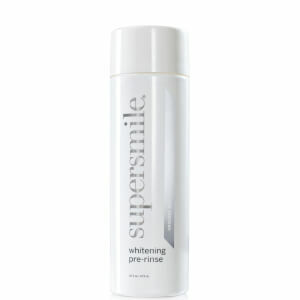 2 days of using it and I have brighter whiter teeth! I can't wait to see what a week will do!!!! Even my biggest critic (my mom) noticed a difference in my smile! Love this product - now I don't want to use regular toothpaste!